The Loctek D7A monitor mount allows you to effortlessly move your 10-27″ monitor securely – up down, left right, backwards or forwards, rotate, and tilt – or even swing it completely out of the way. If you need to reposition your monitor, or your work is environment is tight on space, this is the solution you’re looking for. Here’s what I thought of the Loctek D7A. Standard VESA mount for 75 x 75mm or 100 x 100mm holes. Fits 10″ – 27″ monitors; a heavy duty model is also available for larger monitors. 4.4 – 19.8lbs (2 – 9kg) maximum weight. USB3, plus analogue microphone and headphone pass-through ports on the base. Grommet or base clamp fixing (both supplied). The main body of the Loctek D7A mount is a glossy powder-coated aluminium, with black plastic cable tray underneath the arms. There are no less than 4 joints on the mount, as well as as adjustable gas spring to move it up and down. At the base, +/- 90 degrees. In the center, +/- 180 degrees. Near the monitor, +/- 90 degrees. Ball joint on the VESA mount, permitting +90 to 15 degrees of tilt; and +/-180 degrees swivel. The Loctek D7A is available direct from Loctek.us or Amazon, and at the time of writing is on sale for around $130. If a single monitor mount is insufficient, or your monitor is heavier than the maximum weight allowance, they also offer heavy duty, dual, and even quad mounting devices. Installation will take about 15 minutes. Start by removing your monitor from its existing manufacturer supplied mount, and attach the Loctek D7A using the supplied bolts and washers. Two options are provided for mounting to a desk. First, a clamp style attachment which accommodates a large range of desk thicknesses, from 20-120mm. The clamp needs to be bolted together first, and depending on the thickness of the desk, the base plate has three possible positions; it’s then bolted to the monitor arm. Second, if you need to mount it in the center of a large desk and the clamp is unsuitable, you can drill a hole and use the supplied bolt. The hole can be anywhere from 8.5mm up to 70mm diameter. In both cases, rubber pads are supplied to ensure no permanent damage is done. You may need a helper for this step, who will hold the monitor in place while you bolt the clamp down. You may also find you need to fine-tune the gas spring weight screw to ensure good balance when moving the monitor up and down; this is also easy, using the supplied allen key. Out of box my monitor was a little too heavy, but I soon had it adjusted just right. Finally, thread the cabling through the attached under-arm cable system, and clip the additional plastic cable cover onto the clamp if you mounted it that way. This also hides an otherwise somewhat unsightly steel clamp. You may need to buy new, longer video cables to accommodate every viewing angle you want. The under-arm cable tray was the only area I felt was in need of a slight improvement. Both pieces use a different method of attaching back to the body of the mount, and while the bottom one came off cleanly for me, the top one was stuck on one side and unable to completely pull free. I was forced to bend it quite strongly and force the cables in, and it will undoubtedly break if I have to do that many more times for additional cables, though I don’t anticipate needing to do so under normal usage. One Amazon reviewer noted that the weight capacity may be overstated, specifically around the ball joint mechanism with which the screen can be tilted. I suspect this is actually just a specific case of a manufacturing defect, or over-tightening and stripping the thread. I’m happy to report I had no such issues on my widescreen Dell U2715H LCD 27″ monitor, which weighs in around 5kg, and sits firmly in the mid-range of weight allowance. There was plenty of room left to tighten the ball joints for me, so I have no reason to doubt it would handle heavier loads fine. Once properly tuned, using the Loctek D7A is really effortless. The range of motion is superb; you can push and pull your monitor any which way you like, and it’ll stay there securely. It feels incredibly solid – as indeed it should, if you’re entrusting it to hold your $500+ monitor. I experienced no sagging, wobbling, or anything else. Moving into some extreme positions can be a little awkward and requires you to manually position one of the arm sections first, but most of the time you can just grab the sides of your monitor and move it anywhere you like. I soon found myself pushing it out of the way for more desk space, when I wanted to sketch a design or work on a project; or pulling it in close and hiding the keyboard well underneath when I wanted to immerse myself in code or write. For watching movies or gaming, it’s nice to pull it up and angled down slightly, while I relax back in my chair. Check out the full review video for an idea of the range of motion that can be achieved. Portrait Mode. 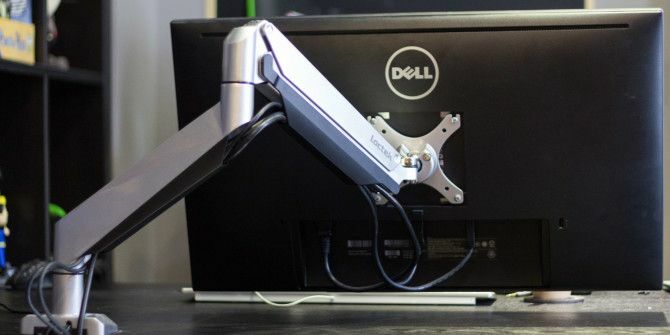 We have such gorgeous widescreen monitors now, but most of that screen space is wasted when viewing documents or websites; with a swivel ball joint, it’s so convenient to spin your monitor around 90 degrees and turn it into portrait. Sit/ Stand Breaks. Taking a quick standing break is no problem; just shift the monitor up and angle it. Obviously, this is only going to move the monitor, so I’m not advocating standing like this for long periods and reaching down to your keyboard – but for short breaks while you watch a YouTube video or read a long article, it’s a simple way to stretch your legs. Even if you can’t afford to take a quick walk away from your desk, you should still be able to manage standing up for five minutes every hour (use these tools to remind you to take breaks 3 Tools to Remind Yourself to Take a Break & Relax While Working at the Computer 3 Tools to Remind Yourself to Take a Break & Relax While Working at the Computer Working on the computer may not be very physical, nevertheless it's tough on your body. If you are damned to spend your working hours behind a desk, you had better find ways to do something... Read More ). Another quick ergonomic tip: when positioning your monitor for extended use, the top of the monitor (not the middle) should align with your eyes. Should You Buy The Loctek D7A Monitor Mount? The Loctek D7A is a versatile monitor mount with clear benefits to anyone who owns a monitor; even if you have no good reason to be moving your monitor around so much, you’ll appreciate the ability to hide it away and clear up valuable desk space. Unfortunately, it’s one of those devices that you don’t realise you needed until you have one. But trust me: this is a fantastic quality, and surprisingly useful product. Explore more about: Computer Monitor, Ergonomics, MakeUseOf Giveaway. I have bought one for my Dad, and he said it is quite amazing when he want to change the position of the monitor for better viewing angle. Disabled Bluhell Firewall, still can't locate whatever it is I'm looking for. I checked my browser's Add-ons, Extensions, & Plugins. Yes, I have Bluhell Firewall, a "Lightweight Ad-Blocker and Tracking/Privacy Protector". I'll disable it & try again. Did I miss the instructions on how to register for this mount? I'd really *love* to receive one of these, but how? Are you running an ad blocker?